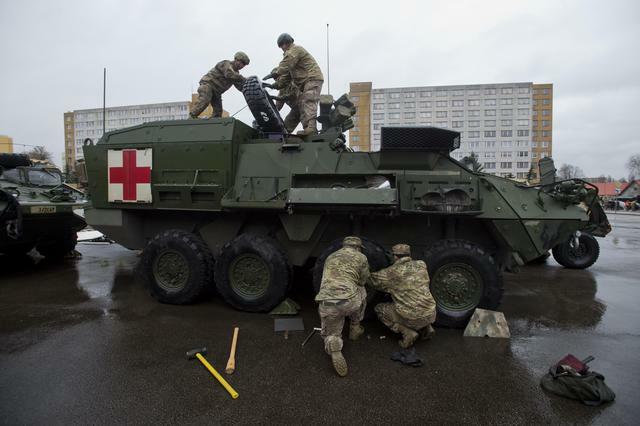 Around 500 soldiers of 3rd Squadron, the U.S. 2nd Cavalry Regiment, are currently participating in the “Dragoon Ride“, a 13-day, 1,200 mile road trip from the Baltics back to their home base in Vilseck, Germany. It’s being billed as the longest such movement the United States Army has made across Europe since General Patton diverted his Third Army to relieve Bastogne, Belgium, in 1944. They’re on their way back from NATO’s Operation Atlantic Resolve, part of the effort to show that the alliance is properly committed to its easternmost members given the regional tensions arising from the Russian annexation of Crimea. The 115 vehicles involved – primarily Stryker APCs and Humvees, with a smattering of tractor-trailers and other tactical trucks – entered the Czech Republic via three different border crossings on March 29th. Each of the three columns spent a night at a different host base before moving on to rendezvous in Prague on March 30th, with the aim of leaving the country with staggered departures on April 1st. The Czech Ministry of Defence has published a handy map of the route. There’s no denying that it’s been good press. Although something of a debate preceded the convoy’s appearance, with some worried about provoking the Bear, the vast majority of people who turned out have been supportive. Around 2,000 people turned up at the Náchod border crossing to welcome the troops, with thousands more waiting in the rain for hours on highway bridges and along the route to watch the armour roll past. The anti-war and/or anti-American contingents – which may or may not be funded from Moscow, depending on whom you believe, were small by comparison, the only one of note appearing in Prague. As Lt. Gen. Ben Hodges, commanding general of U.S. Army Europe, had hoped, there have been plenty of pictures of “kids crawling over those vehicles”, and hundreds have turned up to see the hardware on display in Prague. In purely practical terms, Dragoon Ride is demonstrating – both to Russia and to NATO members – that it is in fact possible to move troops around Europe by road, and cope with the logistical and mechanical issues that will invariably arise during any operation of this scale. The opportunity is also quietly being taken to test the effectiveness of cooperation with air support units, too – the aerial reconnaissance element of Dragoon Ride is being provided by helicopters of the US Army’s 12th Combat Aviation Brigade. This is not something the press coverage is stressing. Lastly, of course, it’s proving that it’s possible to overcome the nightmare of having to coordinate a large scale movement across all the different countries and militaries concerned. Politically, in addition to the obvious and stated aims, there is also some subtle downplaying of historical Russian involvement in the region going on. Visiting Plzeň (Pilsen) today to highlight the American liberation of that city in 1944 carefully overlooks the Soviet liberation of the vast majority of the country, for instance, which is guaranteed to annoy Moscow, so presumably from NATO’s perspective there is no actual downside. It remains to be seen whether Dragoon Ride will leave any long-term legacy, unless it intended just as the first of many such exercises.